David Pressman, a victim of the blacklist who directed dramatic television for nearly fifty years, died on August 29 at the age of 97. Pressman had a fractured career. A distinguished background as an actor and teacher in the theatre, including a long period as Sanford Meisner’s right-hand man at the Neighborhood Playhouse, led naturally to work as a director in the early days of the dramatic anthologies. His debut came in 1948 on Actors Studio, a show that benefitted from its (nebulous) association with the exciting new acting school of the moment, and won a Peabody. From there Pressman moved on to some other forgotten dramatic half-hours (including The Nash Airflyte Theatre, pictured above, for which Pressman discovered an unknown Grace Kelly) and then the summer edition of Studio One. 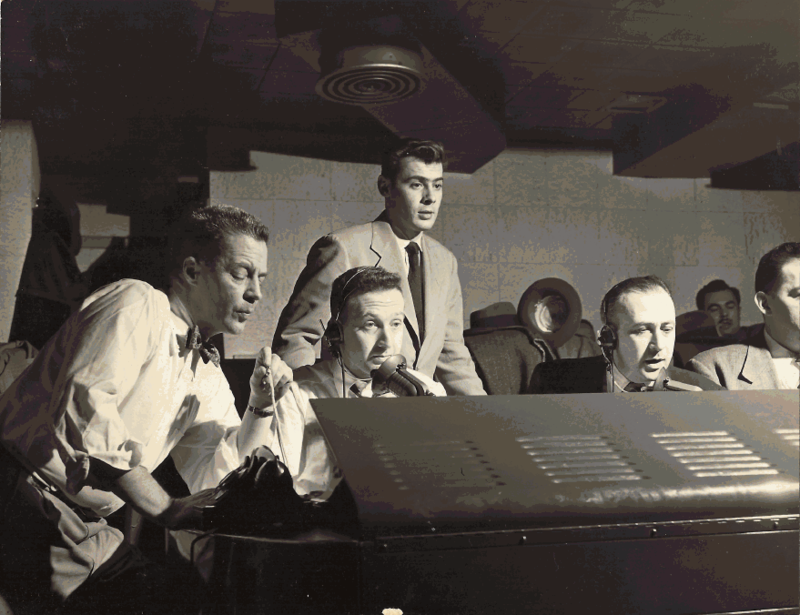 David Pressman (speaking into the microphone at right) in the control room of Actors Studio. Photo courtesy Michael Pressman. Pressman survived the blacklist by teaching (his students at Boston University included John Cazale, Verna Bloom, and Olympia Dukakis) and then directing plays. 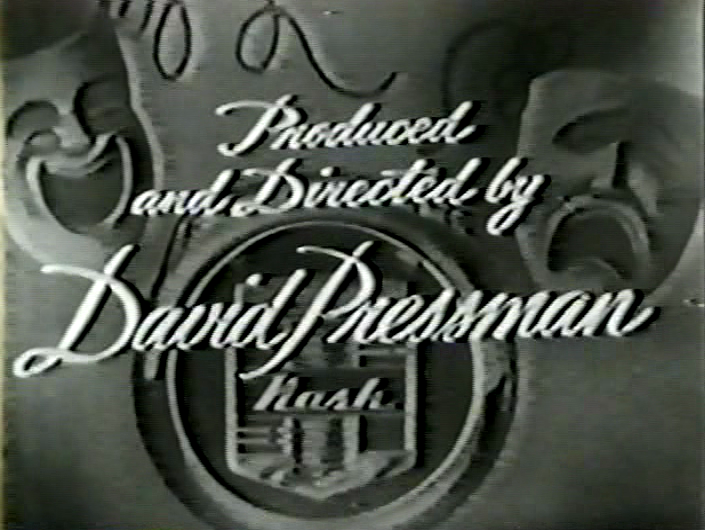 After David Susskind hired him to direct a few small independent shows, the networks finally cleared Pressman in 1965, but the timing was lousy – he got in a Defenders and a Doctors and the Nurses before those, along most of the other serious dramas then on the air, were cancelled. Pressman moved on to nine episodes of N.Y.P.D., and in those he worked with some of the great soon-to-be stars of the next decade: Cazale, Blythe Danner, Raul Julia, and, in the same episode, Jill Clayburgh and Al Pacino. But, barring a move to Los Angeles, soap operas were the only option, and after a short stint on Another World he settled in as the regular director of One Life to Live for twenty-eight years (surely a record, or close to it). He won three daytime Emmys. That’s an impressive accomplishment. But David’s son, Michael Pressman, has been an episodic director for the past two decades, moving among the top dramas of his time – Picket Fences, Chicago Hope, The Practice, Law and Order, Damages, Weeds, Grey’s Anatomy, The Closer – and it bears pointing out that, if not for the blacklist, David Pressman’s resume would probably comprise a list of the equivalents to those shows from the fifties, sixties, and seventies. Fortunately, as was so often not the case with his contemporaries, the historians made good use of Pressman. The Archive of American Television and Syracuse University both recorded lengthy oral histories on video, and I made my own modest (and as yet unpublished) contribution when I visited Pressman and his lovely wife of sixty-some years, Sasha (who survives him), in 2004 and 2005. Diminutive, bald, and speaking in a comforting drawl, Pressman reminded me of a miniature Dean Jagger. He was also one of the nicest guys I’ve had the pleasure of getting to know. One day the doorbell rang and I opened the door and there was two FBI guys. They looked like caricatures. They said, “Do you want to talk to the committee?” Eugene [his son] was a baby, and Sasha came out and put the baby in my arms. They said, “Don’t you want to help your country fight communism?” I said, “I was in World War II. I was a wounded combat soldier.” They said, “Well, don’t you want to . . . .” Whatever it was. They talked to me. I said, “I’m doing what I can.” I don’t remember what I told them. As he related this encounter, Pressman gestured vaguely toward the front door, and a shiver went down my back. “Wait a minute,” I asked, “are we sitting in the room where this actually happened?” Yes: fifty-odd years later we were in the same Central Park West apartment into which the Pressmans moved in 1949. Everything the Pressmans suffered during the blacklist – the strategy sessions for David’s unsuccessful lawsuit against a producer who fired him, the fretting over how to support three young children without any offers of work – I could look around and imagine all of it going on around me. As a historian, one learns things at a remove – in the reading room of an archive, in a retirement home a thousand miles away. This was as close as I’d come to actually being there. It is, incidentally, shameful that Pressman – one of the few live TV directors who rarely, if ever, worked outside his beloved Manhattan – was passed over for a New York Times obituary. More friends of this blog have left us: Kim Swados, who recalled his work as an art director on Studio One in this piece, died on August 30 at the age of 88. His daughter, Christina, who informed me of his death, has launched a website that will showcase her father’s work. Actress Peggy Craven Lloyd died on August 30 at 98, after a long period of ill health. I only met her for about ten seconds once. But Peggy was married to one of my favorite people, Norman Lloyd, in whose company I spent two unforgettable afternoons. Norman is still going strong at 96 and I hope this doesn’t slow him down any.